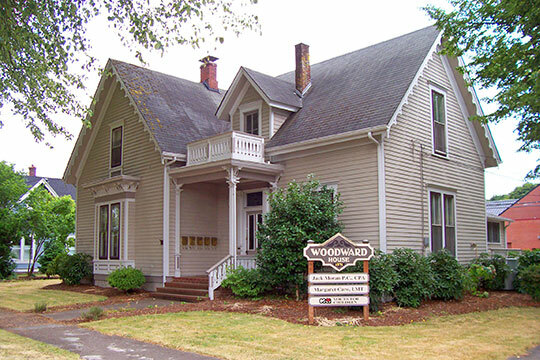 Corvallis City Hall is located at 501 SW Madison Avenue, Corvallis, OR 97339; phone: 541-766-6900. Photo: Elias Woodward House, ca. 1871, 442 NW 4th Street, Corvallis, OR. Listed on the National Register of Historic Places in 1983. Photographed by User:46percent (own work), 2009, [cc-by-1.0 (creativecommons.org/publicdomain/zero/1.0/deed.en)], via Wikimedia Commons, accessed January, 2014. The first white men to settle in the vicinity of present Corvallis were James L. Mulkey, Johnson Mulkey, and William F. Dixon, who arrived in 1845, and Joseph C. Avery, who came in 1846; they settled on lands purchased from the Calapooya Indians. Avery operated a free canoe ferry to encourage settlement here, sold the first town lots, and in 1849, after returning with others from the California gold fields, established a store. The town was officially platted and designated the seat of the newly created county of Benton in February, 1851. Known originally as Marysville, Corvallis was given its present name in 1853, to differentiate it from Marysville, California. The town somehow escaped the raw, rough period undergone by most frontier settlements, though there was an occasional case of "justifiable homicide" mob hanging of a half-breed or an Indian who had made trouble for white people. In 1852 the Baptists erected the first church, and a school was started. Out of this school in 1858 grew Corvallis College. Steamboats began to ply the Willamette and wharves were heaped with freight brought up from Portland at forty dollars a ton. In January, 1855, the legislature voted to remove the territorial seat to Corvallis. Legislators' baggage and office equipment were moved up the Willamette River on the steamer Canemah, which was received in Corvallis with a great demonstration. Asahel Bush, who had been publishing the Oregon Statesman at Salem, brought along his presses and issued the paper here. He said of Corvallis at the time: "A first-class court house is nearly completed. There is but one better in the Territory the one at Salem. . . . The work on the Methodist Episcopal Church here is well advanced; a couple of stores and quite a number of dwellings have also been erected here this summer." The legislators felt that Salem had other advantages than its courthouse, for scarcely had they convened than a resolution was introduced to move back to better accommodations at Salem. In June of the same year the capital was returned to Salem, and Asahel Bush took his Oregon Statesman along with it. Stagecoaches rumbled over the crude roads, and in 1856 workmen strung the city's first telegraph line to the state metropolis. The following year the city was divided into wards, and an ordinance was passed prohibiting people from riding horses on the sidewalks. The second newspaper, the Union, began publication in 1859 and continued until 1862, when it was suppressed for disloyal utterances. It was almost immediately succeeded by the Gazette, which for a time in the early 1870's was owned and edited by Sam Simpson, the poet. Wallis Nash, in his Oregon: There and Back in 1877, provides a glimpse of the town in that year: "We fitted out our expedition at Corvallis, and there engaged probably the best horse-keeper and the worst cook in the State. Horses were hired from the 'Livery and Feed Stables' in the main street, and half the loafers and idlers in the town clustered round us to watch the selection of six horses out of about twenty standing there, presenting a series of groggy hind-legs and rough coats and tails down to their heels. . . ."
The coming of the railroad in 1878 inaugurated an era of expansion for Corvallis, as the distributing point of Benton County's rich dairying and fruit-producing areas. In succeeding decades the town has developed into a modern city with numerous industries based upon the extensive agricultural and timber resources of the region. Among the commercial enterprises are fruit and vegetable canneries, creameries, hatcheries, flouring mills, and a sawmill with a daily capacity of 100,000 board feet of finished lumber. However, Corvallis remains essentially a college city. Works Progress Administration, Federal Writers' Project, Oregon: End of the Trail, American Guide Series, Binfords & Mort, Publishers, Portland, 1940.